RIVERSIDE, Calif., March 19, 2019 /PRNewswire/ -- In 2020, over six billion people around the world will be connected by technology. This will be one of the most significant events in history. It will become a world without borders. The leaders of this generation will have unprecedented advantages as complex technologies will provide them with opportunities that previous generations could only dream of. However, a world without borders for teens is also a world without borders for pedophiles, predators, cartels, gangs and organized criminals. Researchers say that 87 percent of teens sleep with their phone which means predators can access children in the privacy of their own bedroom. Keeping children safe is challenging in a world with advancing technologies like mass audience live streaming, encrypted chat rooms, blockchain, cryptocurrencies, and the Dark Net. A recent study indicates that 9000 children are blackmailed every day with illicit photos through mass audience social media and 58 percent of them may meet up with their predator to negotiate the return of the illicit photo. Global live streaming apps will introduce a child to potentially thousands of predators that most parents would never invite into their living room. 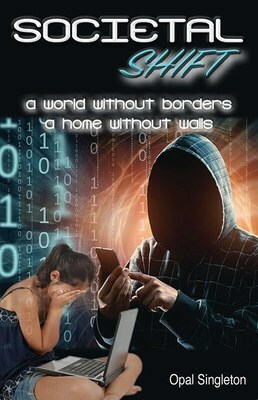 Author, Opal S. Singleton explores how technology is used for these nefarious purposes within her new book "Societal Shift: A World without Borders and a Home without Walls". Singleton is the President and CEO of Million Kids, and serves as the Training and Outreach Coordinator for the Riverside County (CA) Anti-Human Trafficking Task Force. This new book is based on real cases. An exhaustive look at a hot-button topic, Societal Shift could be the most important book you read this year, especially if you are a parent, educator, civic leader, first responder or young person. This is the author's second book. Prior to this, Singleton had authored "Seduced: The Grooming of America's Teenagers." She also hosts two weekly radio shows: "Exploited: Crimes and Technology", broadcasted throughout Southern California by KTIE 590 AM, and "Exploited: Crimes against Humanity", a weekly global INTERNET human exploitation training program that broadcasts through Voice America Variety Channel. You can contact Opal S. Singleton at (951) 323-0298, or send her mail at PO Box 7295, Riverside CA 92513. For more information on Million Kids, visit www.millionkids.org, or drop an email at info@millionkids.org.